With a modern showroom featuring the finest floor fashions available, M&P Flooring brings to Thunder Bay area the most up-to-date products for decorating your home. Whether you're building your dream home or updating and re-decorating your existing home, we are sure to have the product that fits your decor and your budget. We serve residential and commercial needs with a wide variety of quality products with the professional craftsmanship Thunder Bay has come to know as our trademark. We carry well-known CARPETS such as Richmond®, Kraus®, ShawMark® Anything Goes, ShawMark® Elite, Shamrock®, Karastan®, Helios® (wools) and more in store. Create your own custom area rug! Any of our carpets can be cut and bound to suit your style and needs. See our friendly staff for details and pricing. Our HARDWOOD selection brings together some of the finest options available for your floor. We offer a large selection of most domestic and exotic species. Check out the selections from Kahrs®, Laurentian®, Johnson®, Estates®, and Dansk®. HANDSCRAPED HARDWOODS - the latest in floor fashions - are available in both engineered and solid. A full line of these products are featured in our showroom. Visit us today to see our current collections. We carry Armstrong®, Inhaus®, Mannington®, Tarkett®, Cascade®, Richmond® and Laurentian®. Featured SHEET VINYLS are from well-known and respected brands such Armstrong®, Beau Flor, Mannington and Tarkett®. We offer the full Nafco line of VINYL TILES including Permastone. With a style to satisfy every taste, it is also durable enough to stand up to showroom traffic - we have used it in several areas of the store. We added Alterna® vinyl composite tiles by Armstrong® to our product lines and are pleased to report that it has become a popular product with our customers..
VINYL PLANK has become more popular for those that want the Hardwood Look with the ease and care of vinyl. Mannington Adura has a broad selection of planking options from narrow to wider planks to more rustic or traditional styles. Available in Traditional glue down to Locksolid installation methods. Cork continues to gai﻿﻿n popularity with our customers and we're proud to offer Wicander®. They have recently introduced their Hydrocork Collection that features all the benefits of cork that we love with a vinyl plank surface. The added benefit of a waterproof surface provided extra piece mind but still with the warmth and comfort underfoot. We carry a selection of unique and specialized flooring specific for commercial use. Visit our showroom for more information. COMMERCIAL VINYL products include Armstrong®,Forbo, Johnsonite, Azrock® and Amtico® lines, Polyflor products and many others. COMMERCIAL CARPETS, BROADLOOM and CARPET TILES include Kraus®, Richmond®, Venture® and Interface. A 2013 Centiva Installation in progress! The Centiva Collection has many custom options available. Make a grand statement in an entrance or a subtle touch of class to a quiet space. ShawMark Anything Goes! Classics, Anything Goes! Elite Carpets and Anything Goes! Green. Simply the best.... end of story. Beautiful and unmatched in performance. Anything Goes! the original no mat/no crush carpet. Anything Goes! was originally developed almost 20 years ago to address the number one complaint concerning carpet performance - the matting and crushing that creates unsightly traffic patterns. Marking the 25th Anniversary of the Anything! Goes, the Elite line was added. All Elite carpets are a 10 year no mat-no crush 5-star warranty. Anything Goes! Green offers a wide array of appealing looks, so you know immediately that green and stylish definitely go together. There are friezes, textured saxonies, patterned cut/uncut, patterned loop, and multi-colors - gorgeous carpets that set the stage beautifully in each of your rooms. Here are even more of the flooring lines we carry. Visit our showroom to see our full selection. Vinyl Planking is the leading hottest trend in flooring, install with ease and maintaining is a breeze. Come by our Show Room and take a peak. We might just have the perfect look for you!!! 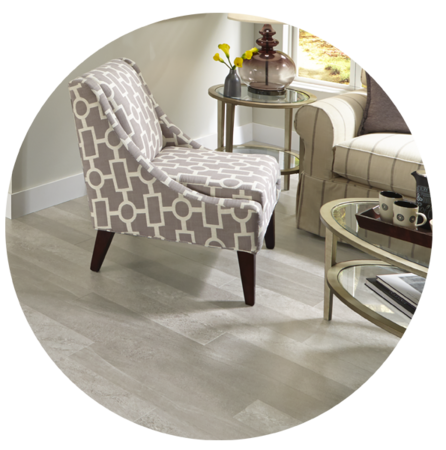 The Meridian Vinyl Tile Collection is one of Mannington's most sought after looks and style. It's a classic look of concrete with time worn, historic detail. Plays well with a modern, contemporary and stainless steel that is trending in kitchens that overall have a sharp polished look. This collection is offered in five shades and a variety of sizes that is unique to this line. Must come by and take a look! Adura Luxury Floors from Mannington. Your style and Adura style - It is a beautifully realistic match! Borders? Patterns? Insets? All possible with this product! 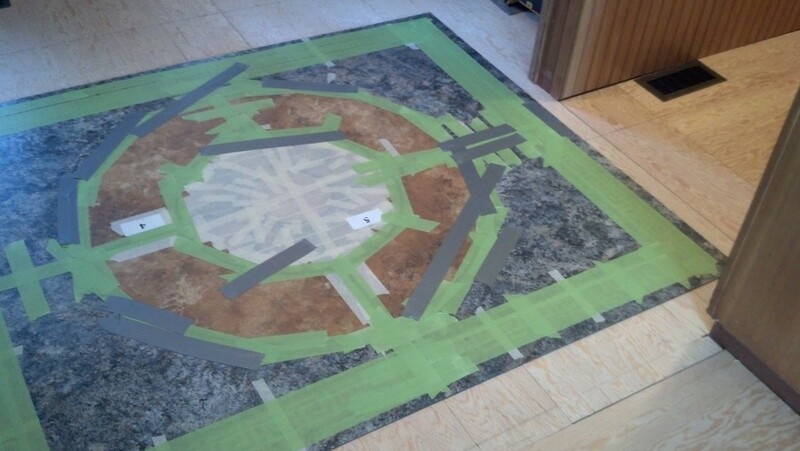 Creating your one of a kind floor was never so easy. Incredible wood styles and fantastic tiles to choose from, all featuring the ScratchResist technology. Beauty and durability combine to give you the perfect solution for today's busy lifestyles. Have it your way - beautifully! Beautifully designed that gives the elegance of a marble floor but with the added cost. Optional to grout or not to grout, comes in two colour choices to suit your space. Available in 12" x 24". Stop by our show room and sign out a sample today! We are always looking for the newest innovations to bring to our customers. Adura Max Vinyl flooring collection offers a 100% waterproof flooring solution featuring a built in under padding great for both minimizing sound and extra warmth under foot. Also features a HydroLoc system that allows extra ease for installation. Adura Max comes in vinyl tile and planking options. Come in and see us and take advantage of our 10% in-store special. Your ideas become reality with ARMSTRONG VINYL SHEET AND CUSHION STEP GOOD, BETTER & DUALITY PREMIUM FLOORING. Visit our showroom or browse through the Armstrong website for the Design a Room interactive viewer and choose the floor that is right for you. Now Featuring Armstrong's new Diamond 10 Finish. A premium tile flooring by Armstrong. Install tiles without grout for a contemporary visual or accent with a coordinating grout color. They offer an excellent assortment to choose from. The vibrant hardwood colours and textures of Luxe Plank radiate luxury and add instant beauty to any room. Authentic plank lengths, along with beveled edges and ends, combine to make Luxe Plank visuals incredibly natural. Choose from a stunning variety of the most popular traditional, exotic and distressed looks to recreate the style of authentic hardwood in any room. Looks like the real thing. Distinctive grain. Authentic textures. Realistic looks create the dramatic beauty and design sophistication found in our laminate flooring collection. They’re durable and affordable, and these floors can be installed anywhere in your home – that's the real beauty of Armstrong laminate floors. 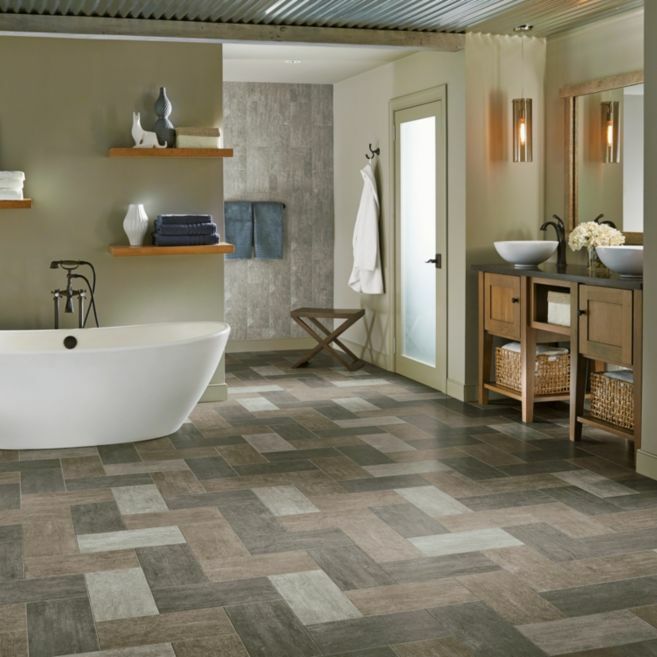 Beau Flor offers a variety of natural tile and wood looks to suite your style and space. Cushion Vinyl is seamless, no grout lines to worry about. Easy to install and maintain, and great value for your investment. Come in and see us, we will give you the grand tour! Cascades carries a variety of vinyl plank collections including Runway, Impact, Creative Options and more. Featuring classic wood patterns and others with a more modern flare. This product is easy to maintain and no hazel if a small repairs need to be made. These vinyl plank collections are also suitable for commercial use. Great for retail space or even would be ideal for an office setting. 30 Year Limited Residential Warranty and a 10 Year Heavy Limited Warranty. Centura offers a wide assortment of flooring options. Commercial Modular Carpet Tiles are are of many. They are a perfect solution for and retail or office space. Do you have a space with high traffic? Want that space to still feel warm and greeting? Then Commercial Carpet Tile is the way to go! Featuring here is the Pulse Collection, available in a variety of colour and design patterns. 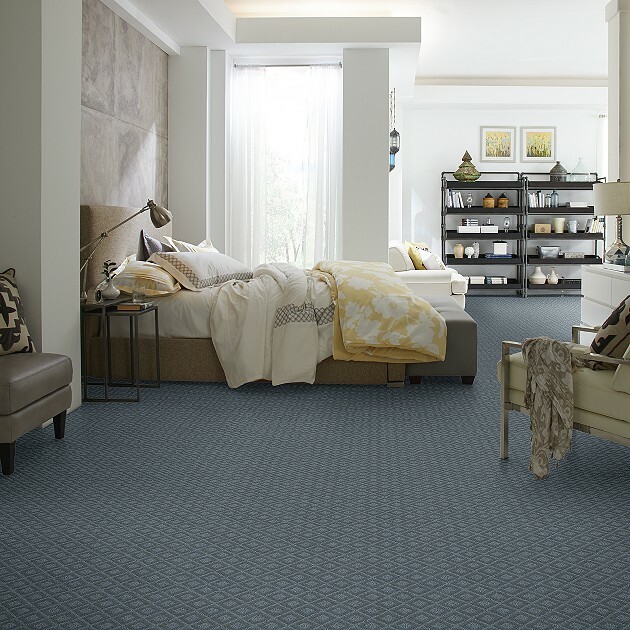 This collection also offers solid broadloom carpeting to coordinate your carpet base or other spaces. Pacific Grove and Mt Shasta Collections are latest introductions to their Dansk Engineered Hardwoods. Pacific Grove gives a casual light rustic style in a European Wire Brushed White Oak Hardwood. Mt. Shasta Features authentic band saw marks in a wider plank giving it rustic overall look. Dansk offers something for everyone from traditionsl solid oak, hand scraped oak and maple. They offer the latest trends in floor fashions and colours combined with a 25 year finish warranty make these hardwoods difficult to beat for looks and value! Full display now in our showroom. Come and see for yourself why our most frequent comment on these hardwoods is WOW! 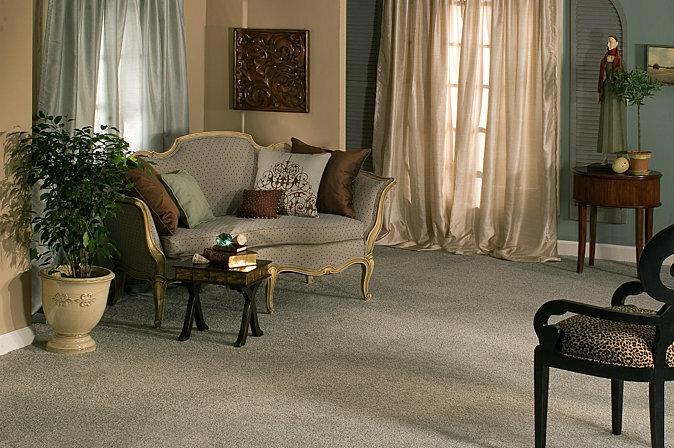 Dream Weaver Carpets offer a quality carpet for an affordable price. Their carpet is not just meant to be cozy and add warmth to any room. With their PureColor System it ensures your carpet and color will last. It won't fade due to prolonged exposure to harsh sun, won't wear in high traffic areas, stain resistant among many more benefits. Come in and see this new collection! Earth Werks prides themselves on their many collections that bring that beauty of nature and outdoors in. Their styles and designs step out of the box and give a new unique perspective to what flooring can represent with no boundaries. They offer an assortment of vinyl planking and tiles in many different shapes and sizes. We have a full new showroom display for all your flooring needs. Take some samples home today! We Love it! Earth Werks also is suitable for any commercial flooring installation, whether a retail shop, restaurant or school. Product comes with an extensive 30 year limited commercial wear warranty. Featured here is the Cocktail Collection. Available in 20 fantastic colours! Please see store for collections we carry. Estates Hardwood ~ New Collections just arrived! Estates Hardwood Collections provide a wire brushed floor with colours that span both vintage and modern looks. Introducing the Old Town and Van Gogh Engineered Series. Old Town features a soft matte finish that gives and oil finish look. The Van Gogh Hardwood offers the same features including a rustic Sliced Face Veneer. Inhaus offers floor solutions to help make your living space more liveable. Inhaus floors are beautiful, easy to install, functional, and affordable. So whether you're looking for a warm space to welcome you and your family at the end of the day, or a stylish place to entertain. elegance becomes a reality with Johnson Premium Hardwood. qualities, Johnson Premium Hardwood offers a wide variety of colors and styles to suit any lifestyle. All backed by long lasting warranties with some products offering up to 50 years. line of wool carpets and borders to suit even the most discriminating taste. We also offer a Karastan Collection exclusive to us that features a variety of luxurious cut piles and tasteful berbers that would add an elegance and statement to any room. Come by our Show Room and take a peak, they just might have what you are looking for. An exciting line of engineered hardwoods. The full Kährs line is available in our showroom. The Kährs Advantages: A Kährs wood floor is 75% more stable than a solid wood floor. It resists warping, buckling and cracking under normal environmental conditions. Kährs - quality wood floors since 1857. Laurentian offers a wide selection of engineered hardwoods in a variety of finishes. Some styles are more traditional and others with a rustic look, hand scraped or wire brushed depending on what works well for your space. Laurentian products can be installed in a variety of methods depending on the space, float, cleat, nail or glue. Don't want to install it yourself? We offer complimentary onsite measures. Give us a call today! Handcrafted and perfectly rustic, Mountain View features artisan hand scraping and hand staining. With handsome character and dramatic graining. A beautifully hand sculpted floor that features time worn color and variation, enhancing the wood’s natural character. We are so excited about the NEW Restoration Wide Plank styles of laminate that have just arrived!! The NEW rustic coloring and styles are fantastic. Mannington offers a variety of different looks from textures to grains, from high-gloss to matte finishes giving a specialty look for any environment. Now available in wider planks to offer a new modern look. Provides beauty, performance and environmental qualities along with a Floor Score Certification. 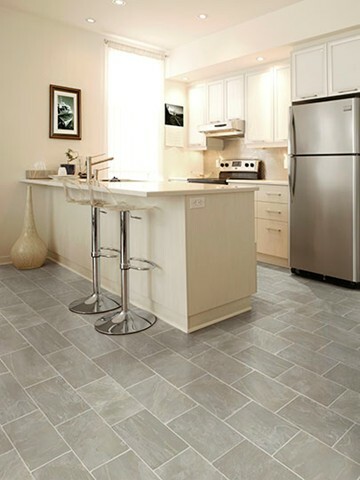 Nafco Luxury Tile and Plank: Solid vinyl tile in a variety of colors and styles. Slates, marbles, even exotic wood styles. Versatile enough to mix and match to create your own personal pattern! We would be glad to help you design a pattern for your home. Browse our in-store pictures for ideas or bring in a sketch with your own. Sizes vary depending on collection - available in 12"x12", 16"x16", 12"x24" and planks sizes 4"x36", 5"x36" (transcend - click only), 6"x36". Nafco Permastone: An array of stunningly natural, large format 16" x 16" designs with the realistic look and feel of ceramic, stone and marble. Some styles now available in 12"x24" designs. Lifetime warranty and Tritonite Wear Layer protection. Durability and beauty. A must see! Now available in a groutless edge that can be installed with or without an acrylic grout. Featuring a wide range of styles and colours for residential and commercial application. 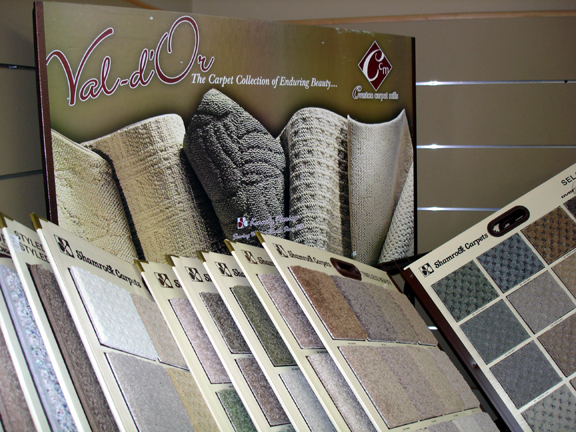 Richmond carpets and carpet tiles offer a selection to suit every taste and budget. Visit our store to view what they have to offer. Richmond continuously introduces new styles to keep up with the ever revolving trends and looks. If you want the hardwood look but not the price tag that goes along with it, Richmond Laminate might just be your solution. Popular collection like Tribeca and Reliance laminates are affordable options with a variety of colour choices. Check out our NEW laminates samples that just arrived! Stature and Ash Collections feature Atroguard Technology - Water Resident, Low Emissions Certification, Non-fading AC4 Wear Layer and is made in Canada. You can't beat that!!! Come check out our Store Stock Special! Easy and stylish flooring options that provides the look and warmth of hardwood but with the ease and maintenance of vinyl. Richmond planking offers a variety of click and glue down products for any space in your home. Some feature a build in cork or EVA under padding that provides added warmth and reduces noise. Stop by our show room and see all that Richmond has to offer. A German made innovation. Sono is waterproof, dimensionally stable, which means this product will not be affected by fluctuations in moisture and humidity. A great flooring solution for camps and cottages. Sono has the highest of standards for indoor air quality. They allow the added piece of mind knowing that it is free of PVC, formaldehyde, phthalates or plasticizers. Sono have AC5 Wear Layer, which is the highest you can get as flooring standards go. They offer a Lifetime Residential and 10 Year Commercial Warranty. Their product comes in a variety of plank wood looks as well as a few contemporary tiles. We are excited about this fantastic new collection, come by and visit our show room we would glad to introduce you! A tasteful mixture of styles - cut piles, patterns and designs suitable for any residential living space. ​Come in today to see our new display. Glueless installation! Change floors anytime! Creative designs! Soft comfort of carpet! Easy maintenance! All this and more in FiberFloor! This unique floor lets you be creative and worry free in the choosing of your floor decor. ​Tarkett Laminate flooring is where high quality meets high design. Whether traditional, organic, sub-tropical or classic, our designs are strikingly realistic and offer something for every aesthetic. Stop by and take a look at the NEW Fresh Start Collection!! More durable and crack resistant than ceramic or stone and more forgiving when everyday articles fall on the floor. Easy to maintain and warmer than traditional stones & ceramics. Available in 18" x 18" tiles with grouted and non-grouted options. New colours should be arriving any day!! From Creston Carpet Mills, M&P Flooring offers Val-d'Or berber carpets with scotchguard protector. Many decorator styles and colors to choose from. Attractive and affordable residential patterns, textures and elegant colourations - perfect for any decor! Wicanders - Cork flooring since 1868. Elegant, Practical and Distinctive Cork Floors. Cork Comfort: Available in 4 styles. Series 100 WRT - Wear Resistance Technology is Wicanders ultimate CORKLOC floating floor solution for the home. It has never been easier to install and maintain, with the state-of-the-art CORKPROTECT technology, a new paraffin-based, all-round edge sealing system to protect effectively against moisture. Along with the resilient and durable finish, making it suitable for all domestic environments, the unique cork structure insulates, absorbs sounds, is comfortable to walk on and feels warm to the touch. Series 1000 HPS - High Performance Surface. If you are looking for a CORKLOC flooring solution that meets the highest durability standards, Series 1000 is the perfect choice. Supplies with a 0.5mm hard-wearing vinyl layer for durability and resilience, this series is suitable for use especially in high-traffic domestic areas such as halls and kitchens. A unique combination of a decorative vinyl surface with comfort of a cork center. This product has a fast and easy installation. The Hydrocork boards are waterproof so they will not swell when exposed to humidity and is low maintenance. Silence, Warmth, Comfort and Impact Resistance is just a few reasons that Hydrocork might just be the right product for you and your home.